The MIST tourism accelerator announced the recipients of four 2017 Mekong Business Initiaitive Innovation Grants. GoP, a travel tech startup from Myanmar, took top prize and will receive USD $10,000. Artisan Origins by TAEC, a social enterprise from Lao PDR, as well as Cambodia’s Camboticket and Vietnam’s Chameleon City, both travel tech startups, will receive USD $7,000. Nguyen Thi Huong Lien and Nguyen Thi Thu from I Love Asia Tour and Nguyen Ngoc Nhu Quynh from Morning Rooms were recognized with WISE Women’s Leadership Awards and will enjoy mentorship through Vietnam’s Women’s Initiative for Startups and Entrepreneurship (WISE). The awards received enthusiastic applause from government officials, destination marketers and tourism industry leaders gathered in Luang Prabang for the Mekong Tourism Forum Gala Dinner. “MIST is globally unique in how it integrates the Greater Mekong Subregion’s travel startups into an ecosystem for sustainable tourism development. 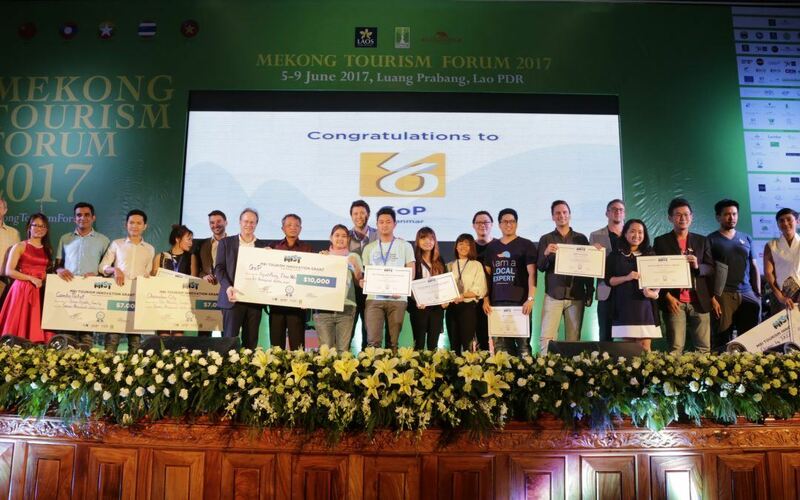 The entrepreneurs I have met through MIST have convinced me that tourism in our region has a very bright future,” said Jens Thraenhart, executive director of the Mekong Tourism Coordinating Office and organizer of the Mekong Tourism Forum. MIST, which stands for Mekong Innovative Startup Tourism, began in December 2016 as a joint venture between the Mekong Tourism Coordinating Office and the Government of Australia and Asian Development Bank (ADB) supported Mekong Business Initiative (MBI). It includes a Startup Accelerator for early-stage startups from Cambodia, Lao PDR, Myanmar and Vietnam. It also includes a Market Access Program for mature startups based anywhere in the world that want MIST’s assistance localizing proven tourism products and solutions into the Greater Mekong Subregion. MIST received more than 250 applications in 2017. Four MIST Market Access Program participants also received awards at the Mekong Tourism Forum Gala Dinner. Adventure Bucket List from Canada and TakeMeTour from Thailand jointly won Best in Show. Malaysia’s BorderPass received the MIST Special Innovation Award, and Malaysia’s LokaLocal took top prize for Social Impact. MIST’s organizers committed to continuing the program in 2018 and beyond, noting priorities for 2018 including establishing partnerships with other incubation and acceleration programs, involving investors in designing the next iteration of the program, welcoming new private sector partners and sponsors, and continuing to identify the region’s top travel startups. Anyone wishing to connect with the 2018 organizers may do so by visiting https://mist.asia/contact/. Adventure Bucket List – Canada – Adventure Bucket List is a reservations system for tour and activity operators. Artisan Origins by TAEC – Lao PDR – Artisan Origins offers authentic, high quality crafts from rural ethnic communities in Lao PDR, a café and information center about visiting handicraft communities, and displays about the ethnic groups, cultural context and techniques demonstrated through the crafts. BorderPass – Malaysia – BorderPass is an opt-in service that expedites ASEAN nationals through ASEAN airports. CamboTicket – Cambodia – CamboTicket aggregates bus, ferry and private taxi bookings around Cambodia and Laos into one platform, creating an even playing field for over 40 operators. Chameleon City – Vietnam – Chameleon City is an on-demand chat-based service providing travel and lifestyle answers from local experts, 24/7. I Love Asia – Vietnam – I Love Asia offers women-led motorbike tours of Hoi An and Hue while supporting projects for disadvantaged communities in the cities where they operate. GoP – Myanmar – GoP is an online tour platform amassing providers and options into one place, offering high-quality service, reliable bookings and instant confirmation. LokaLocal – Malaysia – LokaLocal is a directory of community-based tour experiences in Malaysia. Morning Rooms – Vietnam – Morning Rooms is Vietnam’s largest budget hotel network, helping economical tourists find the right quality rooms for the price they need. TakeMeTour – Thailand – TakeMeTour is the largest and leading marketplace for local tours in Thailand with more than 12,000 local guides from 48 cities. Photos available for download at this link. Please see the photo descriptions for identifying information.